Paul McCartney & James Corden Make A Surprise Visit To The Beatles' Hometown . Beatles Radio: The Beatles, Solos, Covers, Birthdays, News The Fab 4 and More! 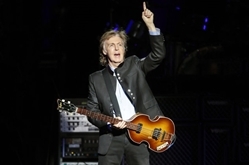 Paul McCartney and CBS Late Late Show host James Corden gave fans a shock Saturday (June 9) when they showed up at several Beatles sites in Liverpool, England. The pair were seen at the Beatles statue in Liverpool, McCartney's childhood home at 20 Forthlin Road and on Penny Lane at the roundabout mentioned in the Beatles song. McCartney and Corden were all smiles when they posed for a selfie at the statue of the Fab Four. While in Liverpool, he also made a stop at the Philharmonic Dining Rooms, where he played a set with members of his band. The Liverpool Echo reported that tickets were being offered yesterday to locals for a "secret gig" with a global superstar. Additionally, there's another mystery for McCartney/Beatles fans: his profile photo Twitter is now showing just a white box and all his Instagram photos have disappeared, indicating that an announcement of some kind could be on the way. He has been known to have been working on a new album for some time, but rumors have also been flying about a special Beatles release to celebrate the 50th anniversary of The Beatles, or the "White Album."